The Gallimimus was discovered in the early 1970's by a team of Paleontologists. It received its name by Rinchen Barsbold, Halszka Osmólska, and Ewa Roniewicz in 1972. The name means "fowl Mimic". It is from the ornithomimosaurid Dinosaur group and was discovered in the regions of Mongolia and Asia. 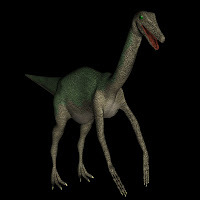 The Gallimimus species are known to be very bird like. Particularly ostrich like. The adult size was roughly 20 feet in length and 6 feet tall of these dinosaurs. It's known that they were extremely fast runners because of its hollow bones, long limbs, long tibia, and short toes. They probably traveled typically in large herds as well. The Gallimimus is known for many body and face features. It has a beak-like mouth, large eyes, a toothless jaw, and probably absolutely defenseless to predators. It had not much of craws or aggressive body armor as well, so the only way to escape would be to run away which the Gallimimus seemed to have to advantage at.